I never officially hosted a Christmas home tour for all of you this year and probably by now you’re sick to death of Christmas! As usual my crazy life intersected pretty pictures and life won! But in case you’re still hanging in here with me I want to give you a quick tour of some spaces in my home I haven’t shared and a recap of some of my favorites that I have. Here you can see the majority of my living room, the biggest room in the house. 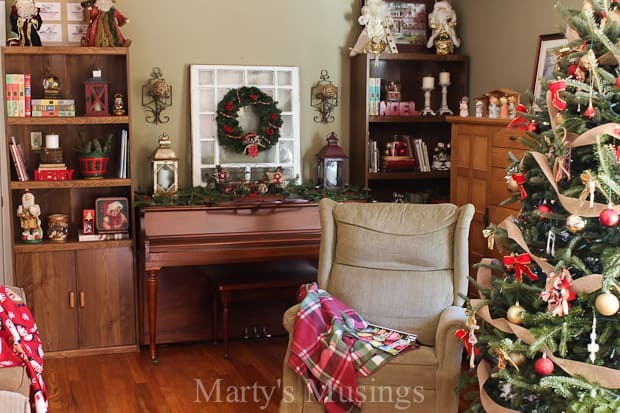 It’s a room that needs an update and I have some ideas in mind for 2016! One of my favorite yard sale purchases ever hangs above the love seat. These shutters were just $1! Can you believe it? 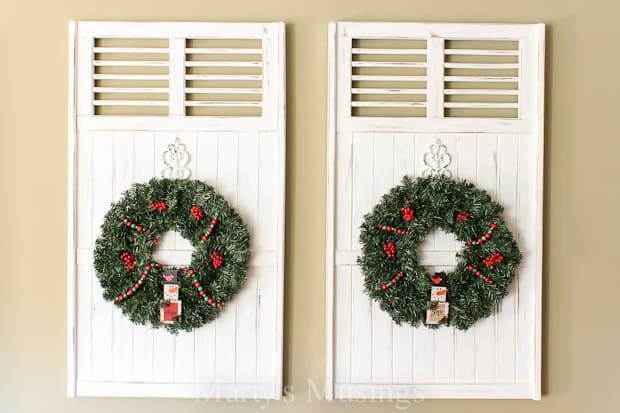 I chalk painted them and then used these $2 craft store Christmas wreaths, old beads, fresh berries and ornaments from Big Lots. 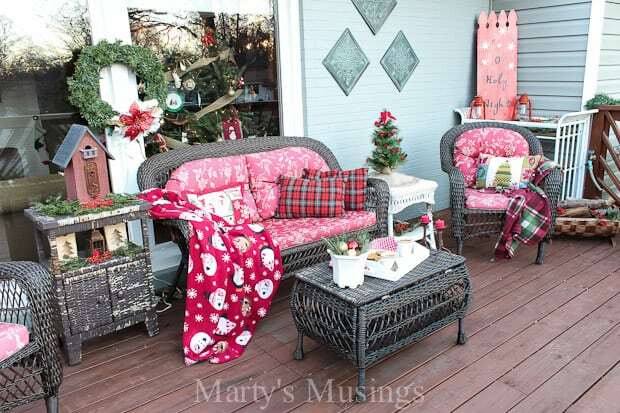 You can see how I decorate them year round here). 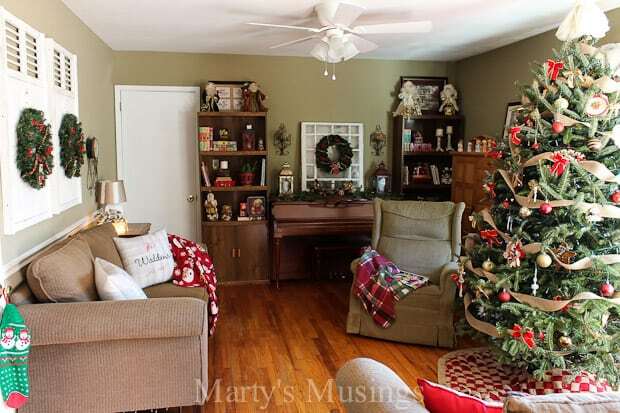 You can see the matching bookcases on either side of my piano (and my pretend mantel). 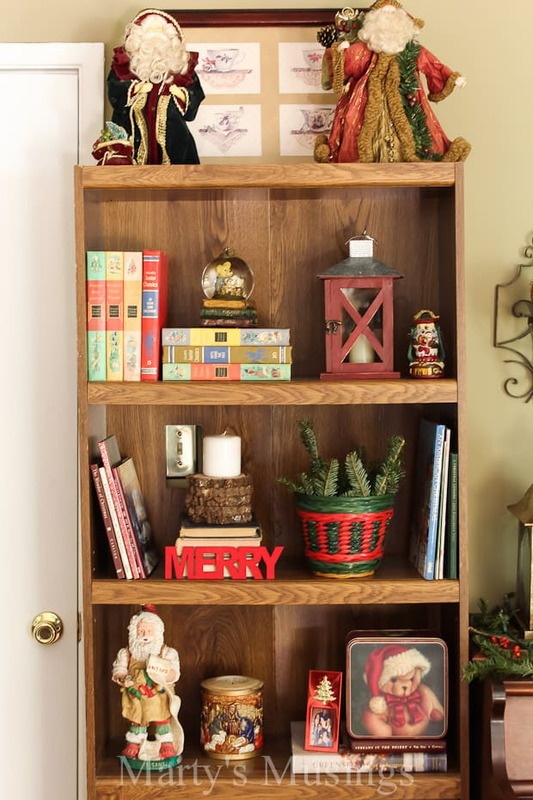 These bookcases are in dire need of a paint job so that’s in their future for 2016. 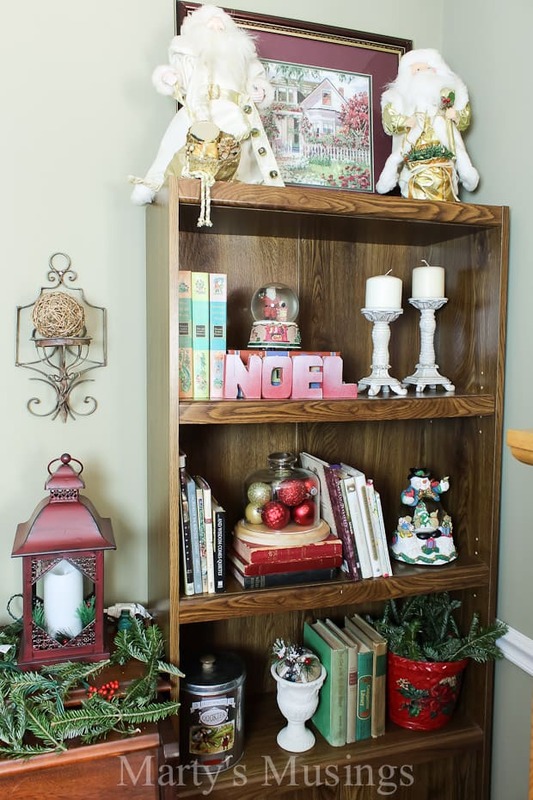 This is the first year I’ve actually decorated both shelving units and it was a lot harder than I thought! 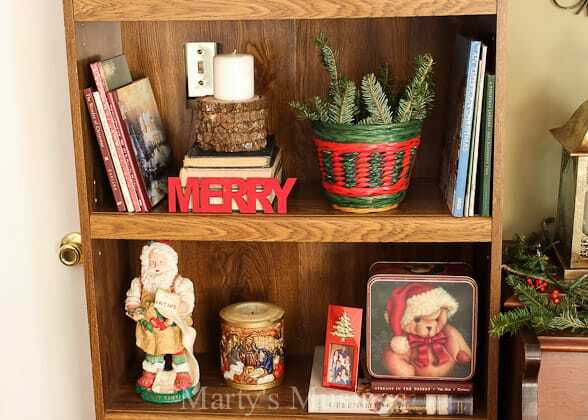 The Santas on the top were my sister’s and I keep them in memory of the way she decorated her home each Christmas. I mingled fresh greenery with lanterns and a few books. All of these knick knacks are from yard sales, from the baskets to the tins and candles. 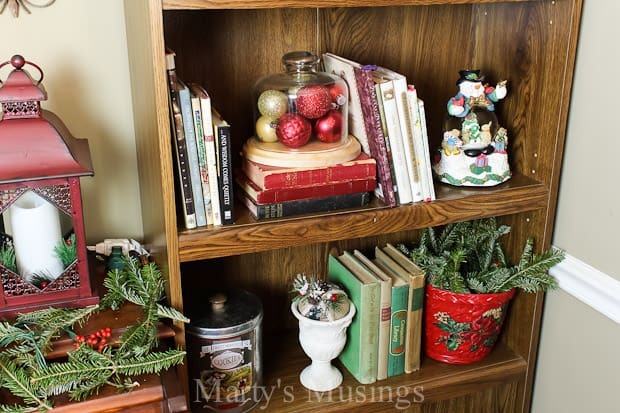 The other bookcase is equally filled with yard sale treasures, books, and a bit of greenery. Decorating shelves is the hardest for me! I don’t have that touch naturally but I’m experimenting and working on it! I have several nativities but this year I only used two; a Precious Moments one that my husband had before we got married and an intricate water globe one. 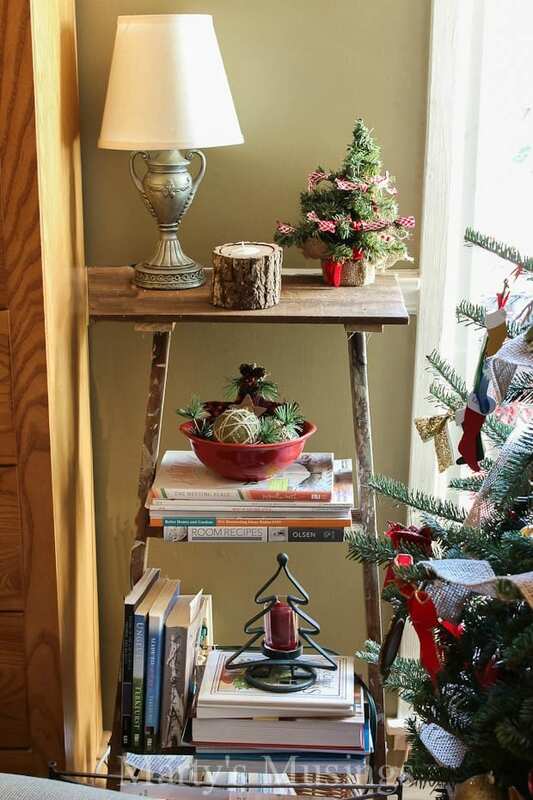 One of my favorite nooks to decorate is this ladder table my husband made for me. A few books and Christmas goodies and it’s my happy place! 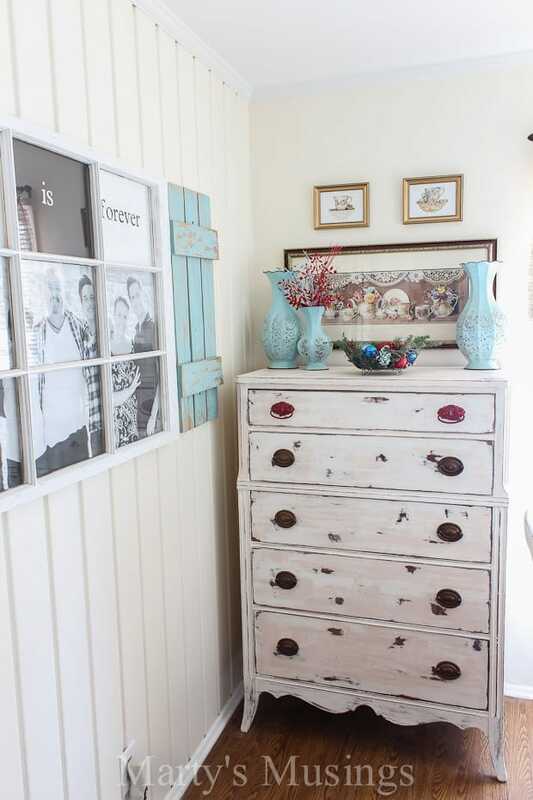 Here you can see the simple vignette I created for my trash to treasure table when you walk in my front door. Some might say the vintage lamp is too big but it was my grandparent’s and until I find a better place it’s staying! 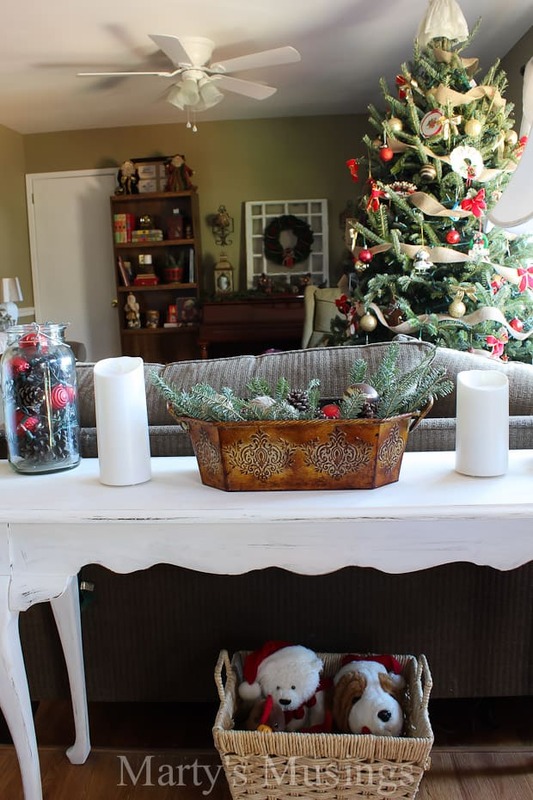 The large mason jar has lights in it for night along with the ornaments and pine cones. You can see the basket of stuffed Christmas animals for my grandson Aiden. My 70 lb. puppy was more interested in them so you might see a nose or ear missing if you look too close! This versatile $1 yard sale copper basket has lived in practically every room in my house! 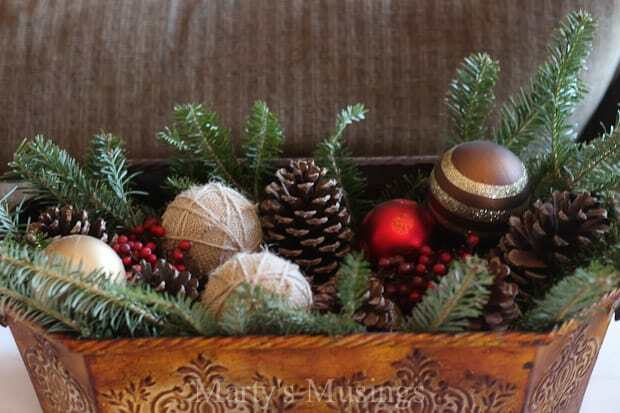 This season I filled it with pinecones, glitter ornaments, fabric balls, berries and greenery. Simple and perfect! 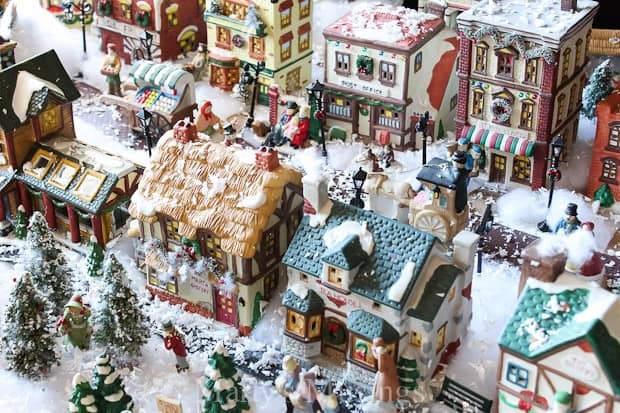 Immediately to the left as you walk into our home is our Christmas village. This year we hung a black sheet behind it with miniature LED lights taped to the back. Sadly I didn’t get a good night picture but I will next year! 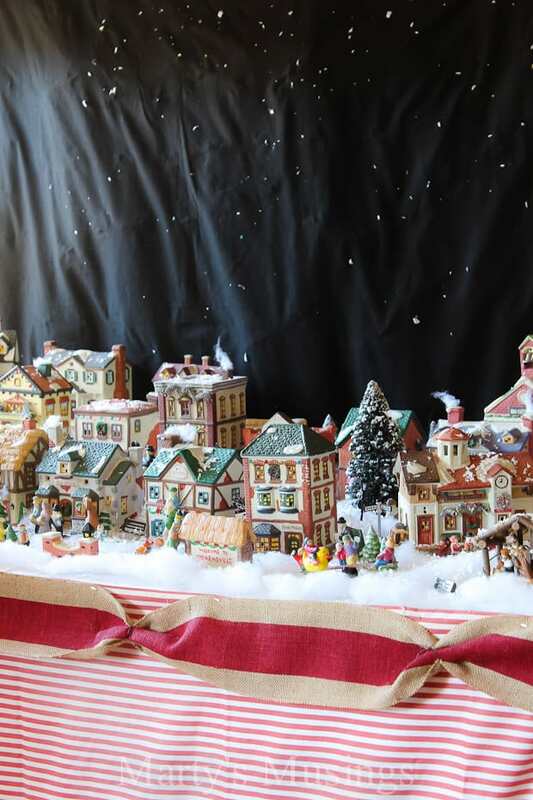 For a step by step detailed tutorial on how we set up our village you can read about it here. I don’t usually photograph this room looking back towards the front door because in the corner you can’t see is my husband’s office nook and bookshelves full of…..books! Not the most welcoming sight when you come in the front door, but when you live in a small house you make do! As we move into the kitchen you can see I decorated with aqua and red. You can read all the details in this post. 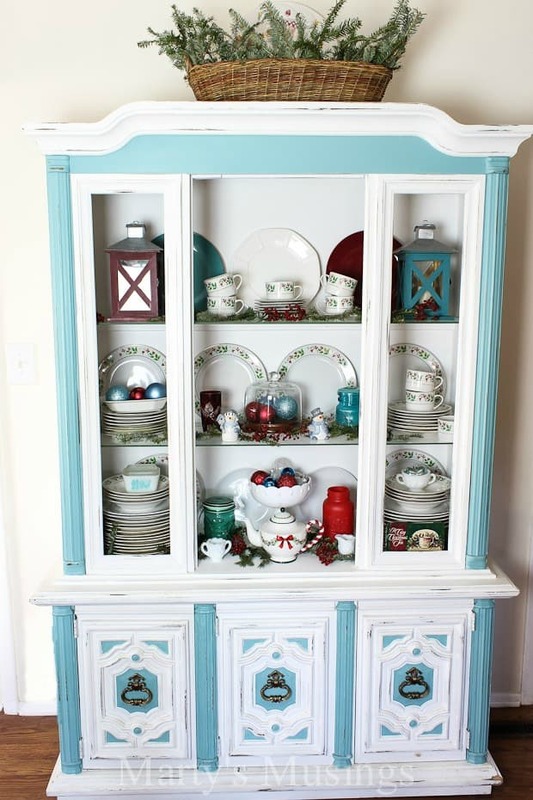 I loved these two colors together so much last year I’m using them all the time in the kitchen! 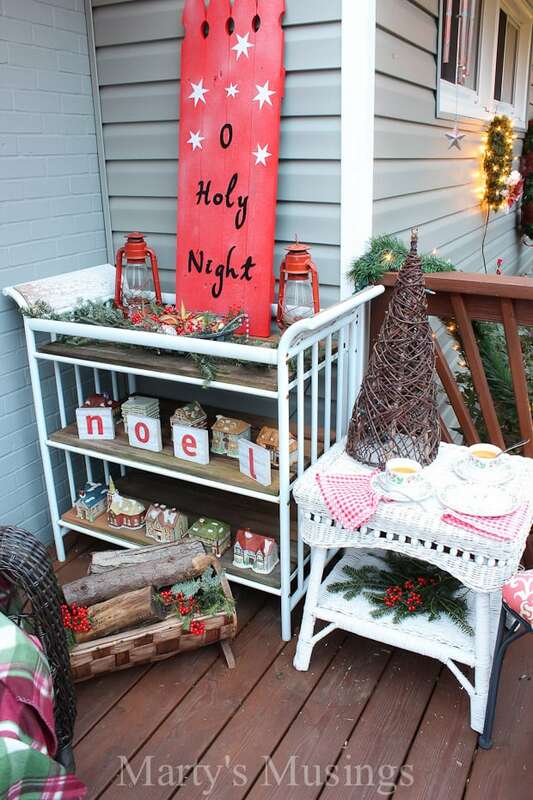 to the curbside tables, yard sale treasures and nature’s own greenery and berries. 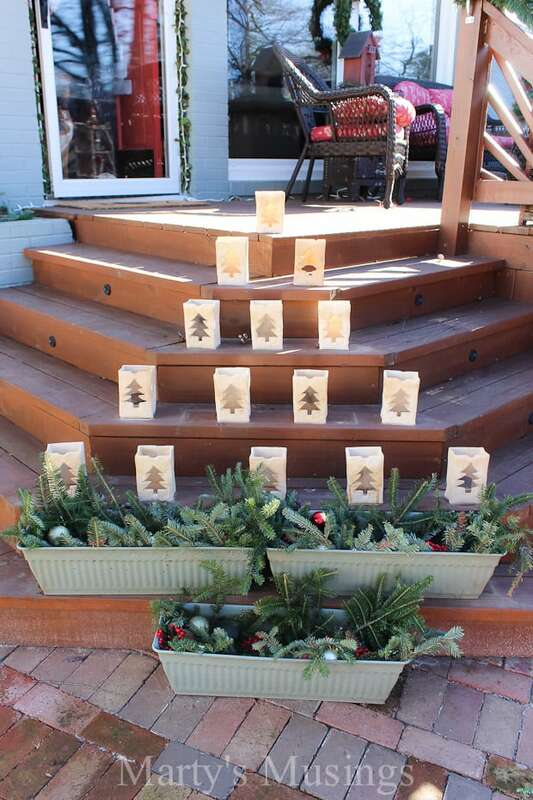 I decorated the front steps with these Christmas tree luminaries (you can get the directions here). Thank you for visiting my Christmas home, even a few days after the big day! 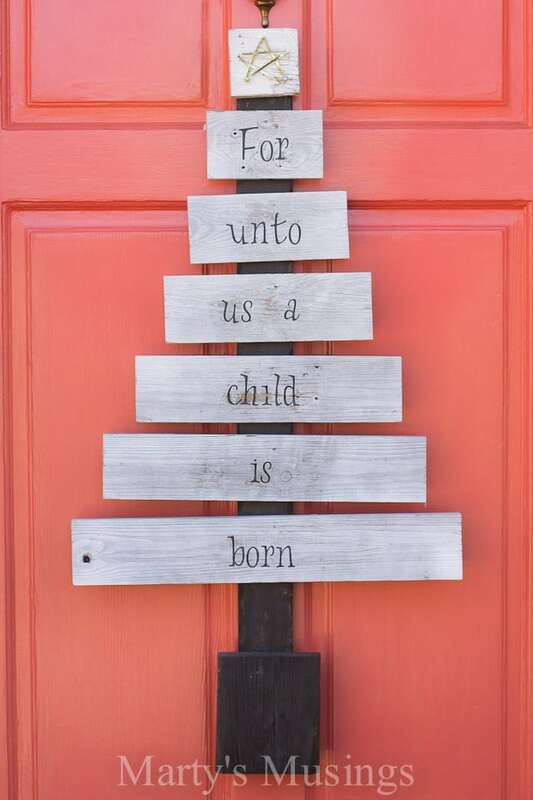 I’m going to leave you with the reason for the season as I wish you a Happy New Year! 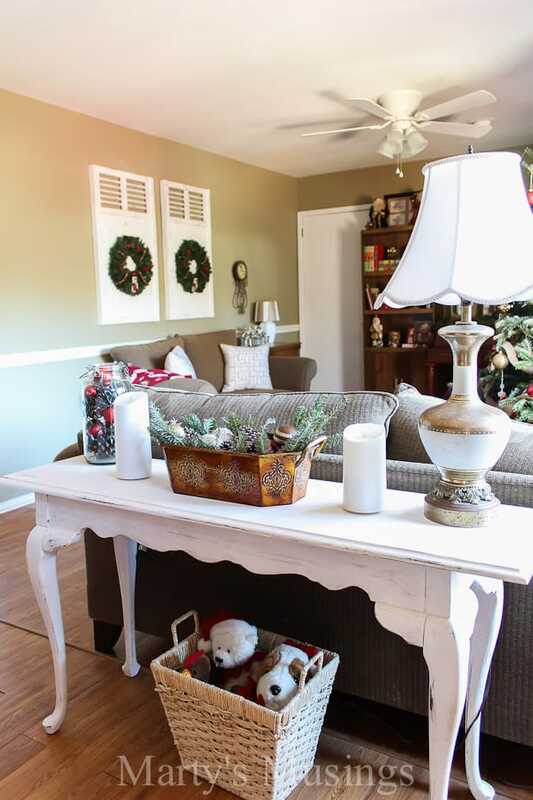 Your space is so cheery and welcoming! I love the way you took items and completely personalized them. Loved the tour of your beautiful home!!! Thank you for sharing!!!! You really have a knack for decorating!!! I too have many village houses – from various makers – chose each of them just because I liked them. 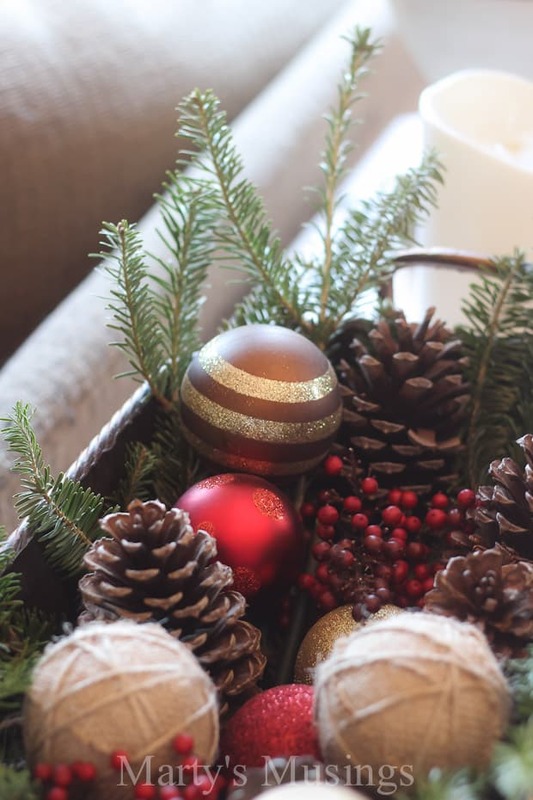 I don’t have space for a large table, but I do have a space above the fireplace (home builders used to make those to accommodate large TV’s (before flat screen era) – and since we aren’t going to break our necks to look up at TV, I use the space to decorate with each season. 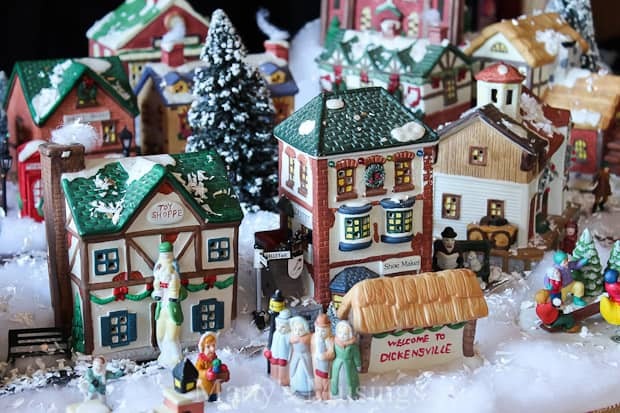 Back to the village: – I make a mountain village each year – using the original boxes the houses came in and various shoe boxes. It does take me a while to get the boxes just where I want them (turns out a bit different each year). Have lots of people, objects, trees, etc. to go along with it all. 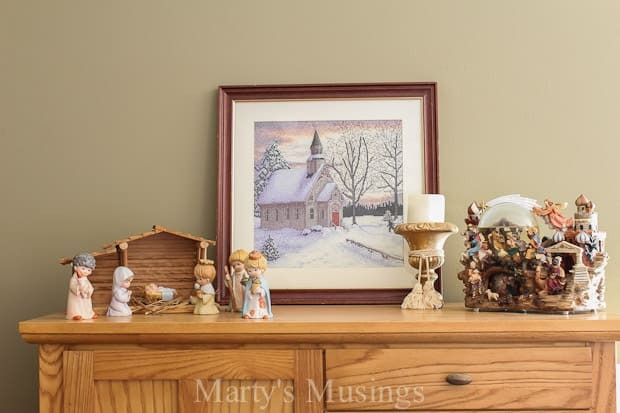 Then I have an antique piece of furniture across the room – and I use the top of it to put my larger houses up there – about 5 of them – too large to put with the mountain village. Also have a small shelf in our entry way that I put very small unlit houses and a few people (and hope each year no one bumps it). 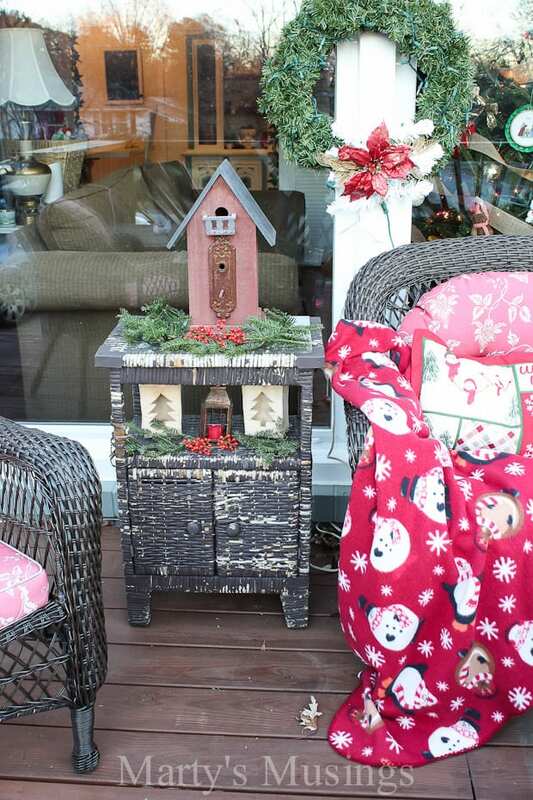 Thanks for talking about having a small house – we do too – I love all the big house displays but have to be realistic with ours. 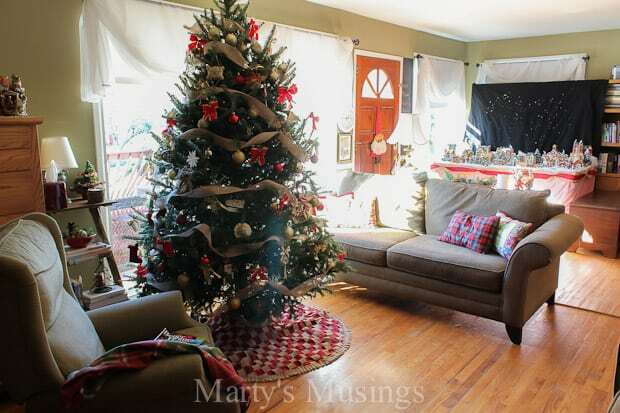 Also, our choice of decorating tends to be a mixture of Williamsburg, country, antiques, and a ton of folk art. I just found your wonderful website. I love your down to earth philosphy and it gives me renewed hope for our home!! I can’t wait to start adding more coziness using your genuinely inspiring tips! Thank you and Merry Christmas! Hi, Christine. Thanks so much for your wonderful comment. I hope you’ll signup for my emails so you’ll find out when I put out new blog posts. 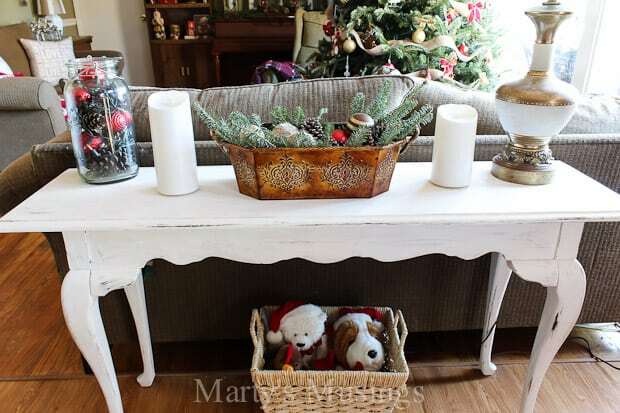 I love to share my thrifty ideas and ways to decorate on a budget. Have a wonderful Christmas!